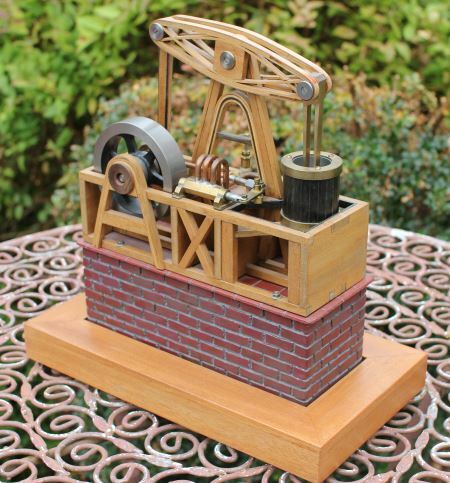 I designed and built this engine with an intent on making it aesthetically pleasing. 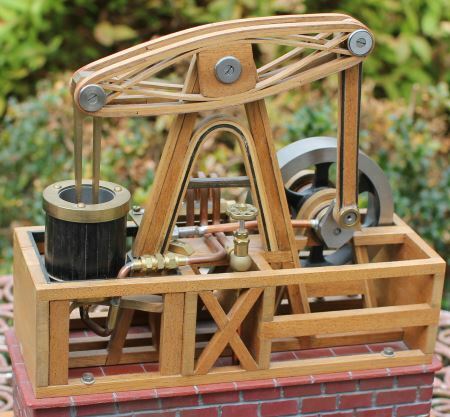 The engine was designed as I went, nothing that new there for me, and the whole build was described in our older pages here: Wood and Metal Beam Engine Build. The collection of images here show the fully completed engine from different angles with a few numbers to put it into context. I also wanted to link to a number of other pages, engines and designs that show more of that mixture of wood and metal. The beam is made using a steamed wood construction method, the two parts of the beam being made together so that they match perfectly and fit either side of the main post. All of the axles and bearing surfaces are metal. The main connecting rod from the beam down to the crank is a wood and steamed wood construction with brass inserts for the bearing surfaces. The main upright pillar that supports the beam also forms the main centre construction in the frame of the engine. Amongst the mix of beams and pipes you can just make out that the main upright for the beam and the bent wood supports for the flywheel have a cross-bar in the frame to add strength and to form the letter “A”. The valve is a simple slider driven from an eccentric off the main crankshaft via a crank. The crank allows the valve mechanism to be folded giving a more compact design. At the same time the crank allows the movement of the eccentric to be amplified and so allowed me to get a much cleaner valve actuation. 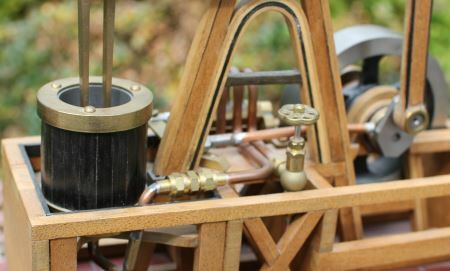 The cylinder is made from cast iron with a lower brass cylinder head with a hole in the middle for steam/air in and exhaust out, this connects to the centre point of the valve. 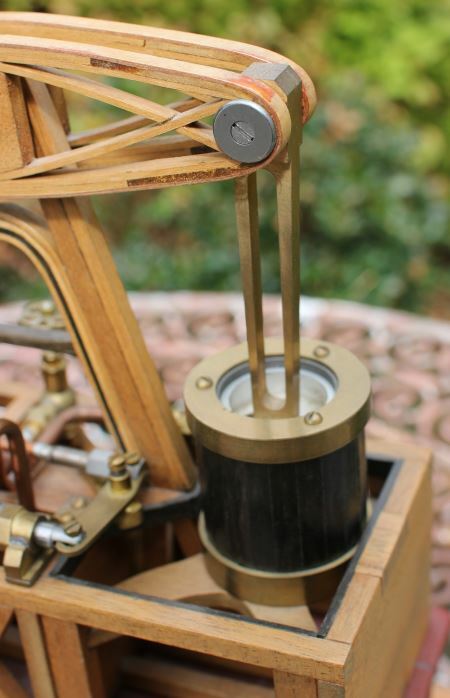 The brass end caps were machined with a 1.5mm clearance to the cylinder around the circumference, thus allowing the wooden strips to be held in place. A recess in the cylinder allows insulation to be installed between the cast iron cylinder and the outer wooden planking. The wooden planking is bog oak, roughly 3000 years ago the oak tree fell into the bog and preserved in the peat until very recently. The wood is dark with fantastic grain structure. The brass end caps are bolted to the cast iron cylinder. 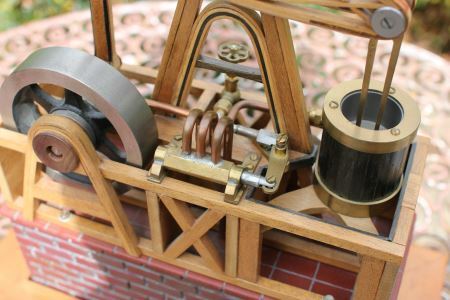 The brass cylinder head is then itself bolted to the main structure of the engine frame. The engine runs like a dream on compressed air at very low pressure. More of my engines are in my gallery page.